The PEN Ten is PEN America’s biweekly interview series curated by Lauren Cerand. This week Lauren talks with Kyle Minor, the author of two collections of short fiction: In the Devil’s Territory (2008) and Praying Drunk (2014). 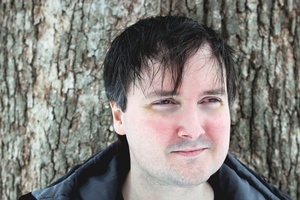 He is the winner of the 2012 Iowa Review Prize for Short Fiction and the Tara M. Kroger Prize for Short Fiction, one of Random House’s Best New Voices of 2006, and a three-time honoree in the Atlantic Monthly contest. I came late to literature and to writing, in part because I was raised in a Southern fundamentalist community that didn’t value either. I didn’t read anything other than one novel each from Faulkner and Hemingway until I was twenty-four. Kurt Vonnegut was my gateway drug. After I found Slaughterhouse-Five, I read all his other books straight through, in chronological order. Then I did the same with Don DeLillo, then Toni Morrison, then John McPhee, then James Baldwin, then Milan Kundera, then Philip Roth. By then I had learned enough about other writers that I could start to read one book at a time. It was a backwards education to be sure. I am partial to the fantasy that Alice Munro and Barry Hannah had a secret love child, and that child was me. The revision gets done in the quiet, at home, but when I’m drafting, I prefer places where I’d never see other writers, or academics, or anybody with money. Quite a lot of Praying Drunk was drafted in dive bars in Columbus and Toledo, Ohio, in a creaky old house in the middle of the Daniel Boone National Forest, and on the porch of an orphanage in an agricultural village in the mountains of Ouest Province, Haiti. In college they handcuffed a few of us for breaking into an abandoned pencil factory in Indiana, and rapelling off the water tower, but they let us go with a lecture because we were white people. That’s America. All the worst, according to The New York Times reviewer. The absence of the childhood god, time, form, death, despair. I wrote these two books of short stories, and even though hardly anyone read them, they burned down the twin houses of family and community of origin. I regret it almost every day, even though I know it was the right thing to do. Be true to the speaker. Don’t tell the right version of the story. Stare hard at the distance between the story you’ve been telling yourself about how the world is, and the more complicated version life is revealing, the version which will probably undo you. I wish American writers in general were less anti-intellectual, more interested in the interior life and exterior systems of power. I don’t come from a subculture that had much in the way of an intellectual tradition at all. My people believed there was only one answer to every question, and after that you stopped thinking. I’ve been leaning hard on a couple of generations of postwar American writers of various Jewish ancestries—Saul Bellow, Cynthia Ozick, Philip Roth, Isaac Bashevis Singer, and Bernard Malamud among them. They set the stakes sky-high, they never stopped with the insistent questions, they weren’t afraid to be wrong, and if sometimes they were, it’s only evidence of their fearlessness. At least they were braving the conversation. I don’t know that a book would sway the leader of a government that imprisons writers. I’d try to get the books to the nineteen-year-olds who haven’t yet come into their power. Maybe the idea that there is a line between the two is what got us in this mess in the first place. Maybe we’ve been taking all the observation and surveillance for granted for too long, and we still don’t know what the consequences will be, personal or public.